wearing outfits that were oh so pretty. Well I think my poetry leaves a lot to be desired, but this certainly sums up the week Andrew and I (and Daddy) have just had. It started last Monday morning, when we went to our usual group at Chesterton Children’s Centre. We eased ourselves in gently to the party week, as this was not so much an organised party, but rather the refreshments had a Christmassy feel to them, some of the toddlers wore Christmassy outfits, and we sang Christmas songs at the end. Back home for some lunch and a power nap (Andrew that is), we then headed out to Rhyme time at Barnwell Road library for a proper Christmas singing session. But when we arrived, complete with a tub of oat and banana muffins to share, it came to my attention that the Christmas party was in fact the following Monday! Thankfully I wasn’t the only baby-brained mum who’d got mixed up. Oh well, not to worry, we joined in with the usual, all-seasonal songs. Tuesday’s party fun is reported here second hand, because that’s when Daddy and Andrew time happens each week. 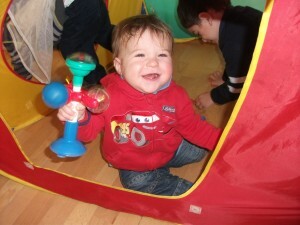 My two boys toddle off together to Little Music Makers, a music (obviously!) group run by Chesterton Parents’ group. According to my music group correspondent / photographer (aka Tom), great fun was had by all at the Christmas special. There were toys and party food (including some oat and banana muffins – they get everywhere! ), as well as the usual singing and dancing (I’ll say more about that in another post sometime). Father Christmas even turned up, with presents for all the little ones. 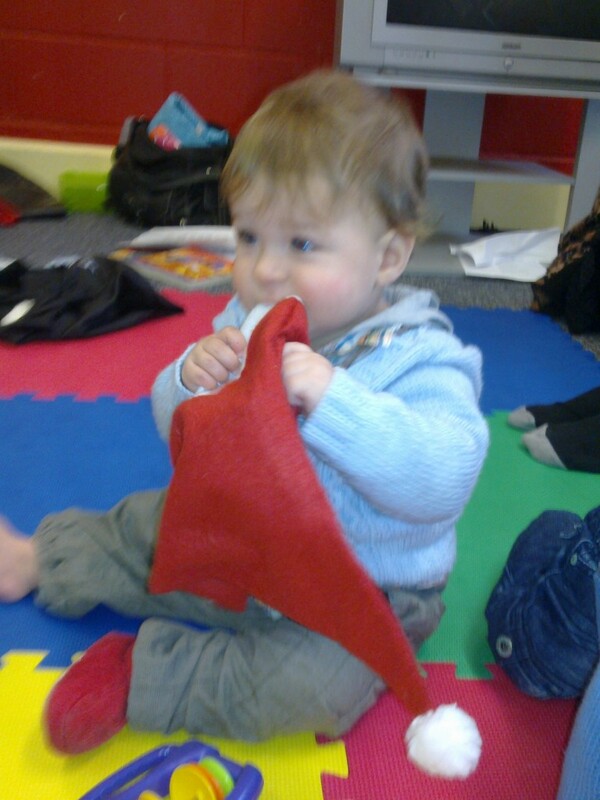 Andrew didn’t seem too fussed either way about this strange man with a white beard in a red cloak, and proceeded to use the nicely wrapped up book he was given as a teething toy! Meeting Father Christmas - Andrew didn't seem too bothered either way! 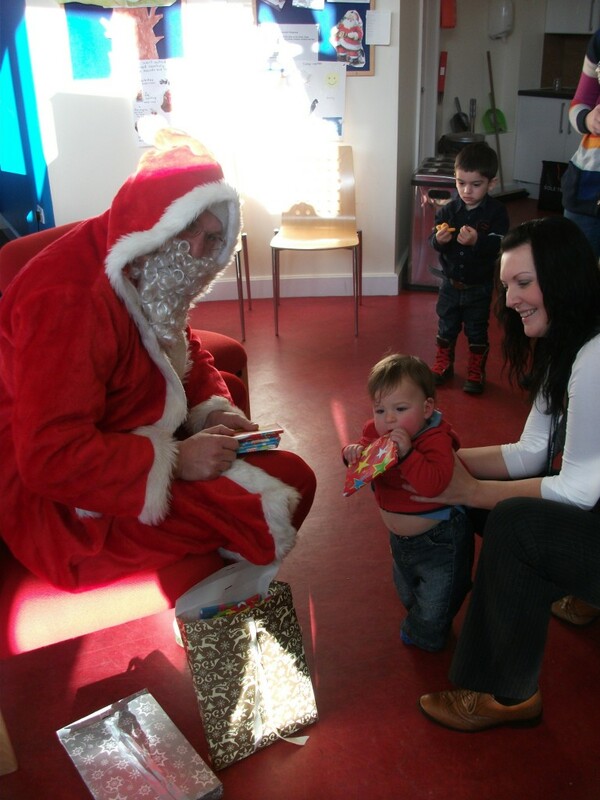 Come Thursday we needed a rest from our packed Christmas social schedule, but by Friday we were raring to go again. 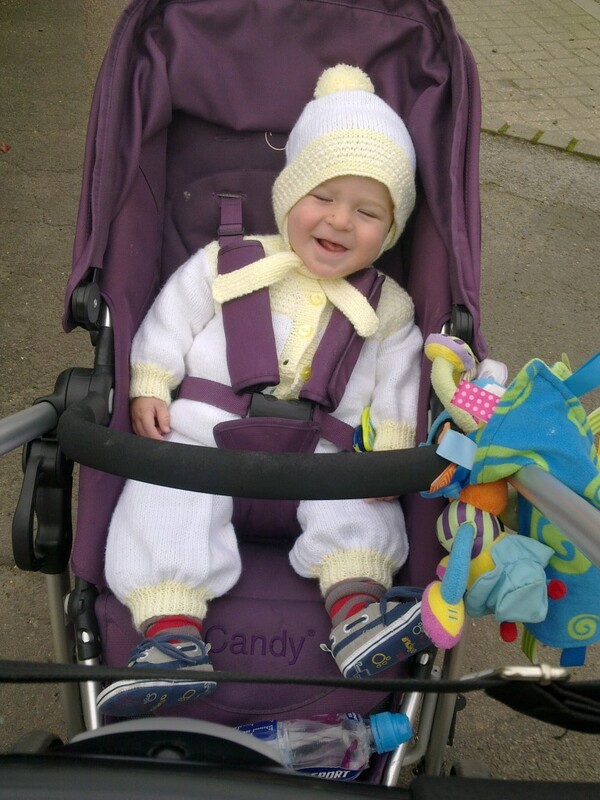 Andrew and I joined the Cambridge babysigning group a couple of months ago for 5 weeks, but then I went back to work and we couldn’t commit to every week before our routine settled down. (I’ll definitely do a whole post sometime on babysigning.) But Bethan, the tutor, kindly invited us back for the Christmas special. We learnt some seasonal signs like reindeer, sleigh, Father Christmas, angel and Jesus, and had lots of fun singing and signing to Christmassy songs. The weekend arrived, along with time for some rest at home. 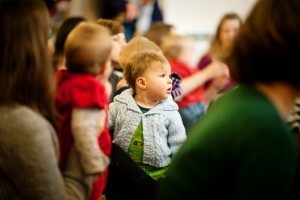 Monday saw the last of our Christmas parties; this week really was the Rhyme time Christmas special. As we entered, damp and soggy from the rain, we were greeted by cheerful Bobby and Ruth, who were dressed up in costume and tinsel. The songs we sang were specially selected for their Christmas theme, and then we heard a story about a pirate (not so Christmassy). 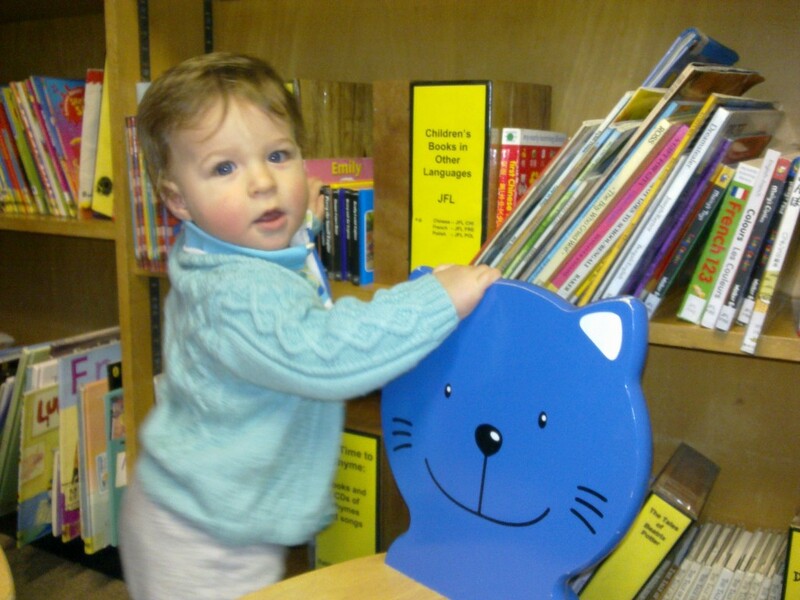 After all the musical and rhyming fun, there was plenty of food to share, and Andrew had his usual excitement looking at all the books, which he absolutely loves (clearly my son), and pulling himself up on the perfectly-sized mini cat-face chairs! One week, five parties, many songs, lots of food and stockingfuls of fun! Have you had fun at Christmas parties that you’ve been to? 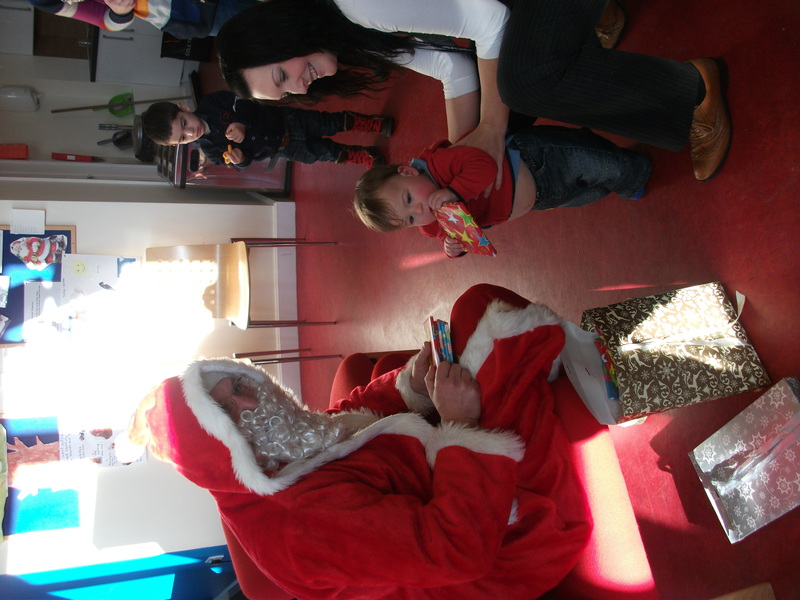 Did Father Christmas turn up at yours too?! (He gets around, you know.) I think it’s fantastic that there are so many parties we can go to in celebration of Jesus’ birthday, because he was a special little baby who went on to do amazing things. 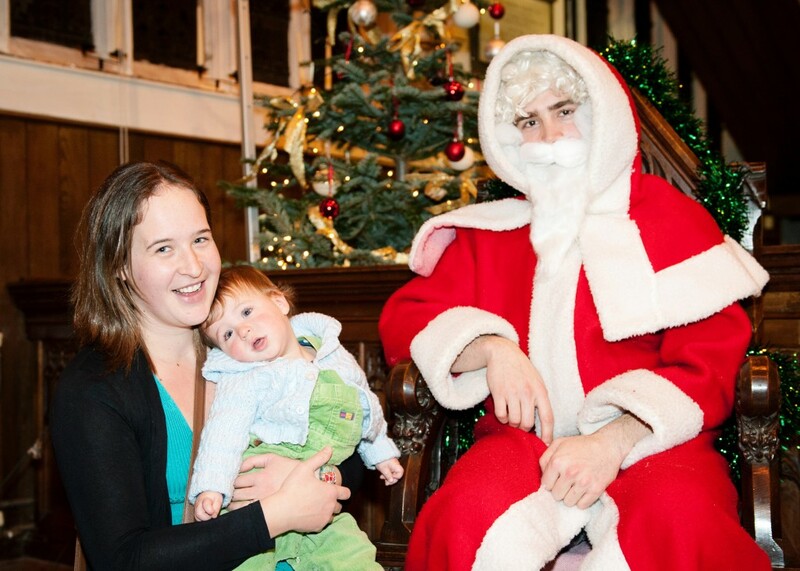 This is Andrew’s first Christmas, and he’s certainly had a great introduction to what a fun time of year this is. As he grows up, I’m going to make sure he learns about the reason why he has so much fun at Christmas. it’s Saturday/Sunday = have some family time, then do some housework or go to church. We’ve been in this routine for over a month now, since I started back at work half-time after 9 months of maternity leave, and it seems to be working. Two and a half days a week I work as a post-doctoral research associate (fancy name for the fact that I do research and have a PhD). I’m based in the Department of Experimental Psychology at the University of Cambridge, as the resident phonetician in a lab of psychologists and neuroscientists. The project that I’m working on is looking at how children with a language impairment perceive rhythm and pitch in language and music. I should go into that in detail in another post, but for now I’ll stick to the balancing act of being mum and going out to work. Before I went on maternity leave, I loved my job and felt very privileged to have been offered it, given the competition for academic jobs when funding is relatively limited. I planned to go back part-time after 9 months, though I found it hard to return once those months were up, because I enjoyed spending so much time with Andrew when on leave. There was a feeling of being torn between two jobs I loved doing, and there still is most days. Being with Andrew all day really makes me happy, but I do see advantages to going out to work too. I thought I’d share some of the things I like and don’t like about splitting my week in half. At the office I get to drink hot cups of tea, eat my lunch when I like, and there’s not a nappy in sight. As I work in town, it’s very handy to pop out at lunchtime and go shopping for a few bits without the buggy. I have such lovely work colleagues who are great friends and make the office environment a happy, sociable and productive one. It feels good to know that I’m taking part in research that ultimately aims to get to the bottom of something that affects many kids, and one day may make a positive difference in individual lives. People talk about being able to ‘use your brain’ again and get ‘mental stimulation’ at work after having a baby, and that is true to the extent that I get to put to use my ‘training’, i.e. the skills for research that I gained by doing a PhD and continuing in an academic job. But I would say my brain gets put to good use looking after Andrew too. I mean there’s no training for being a mum, so you figure things out as you go along, and that uses a fair amount of brain power I find. All the things that I’ve started to think about and get interested in since having him certainly keep me mentally stimulated. An example is doing my own ‘research’ on baby-related matters, by reading up and talking to other parents about issues like breastfeeding. I can do this either at groups when Andrew is with me and happy to play with the toys and other kids there, or at home when he’s asleep and I need to put my feet up. So I feel like I get enough brain usage on both Andrew days and office days. My Andrew days are fantastic because I get to see him develop and start doing things he couldn’t do the week before. 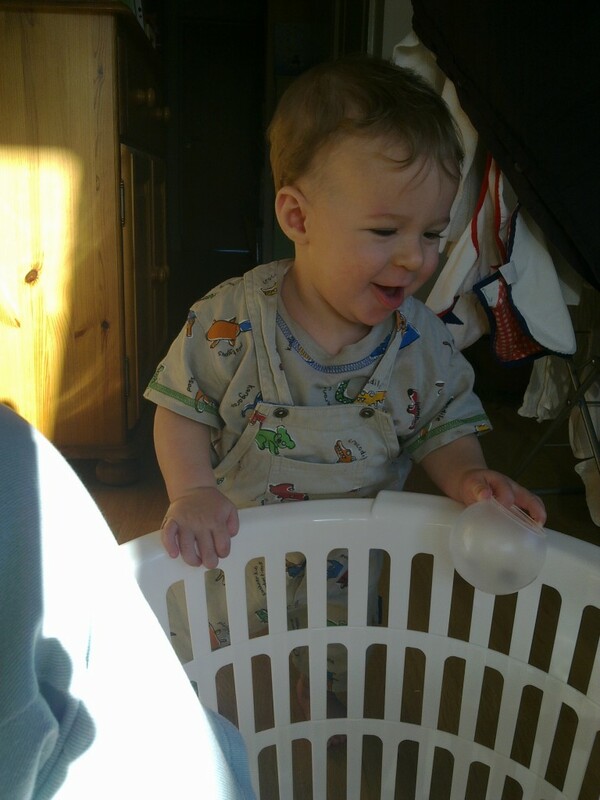 He is such a good-natured baby, so I get lots of smiles and cuddles. 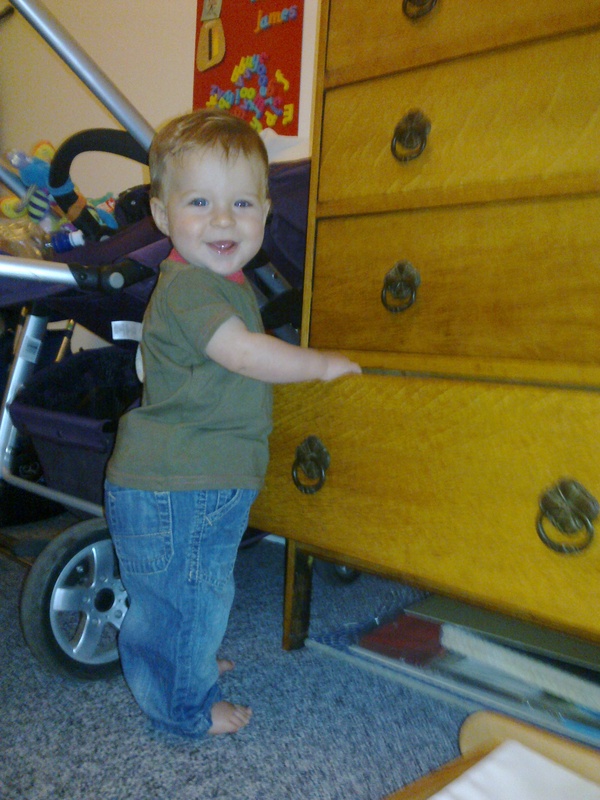 There’s never a dull moment as he’s so active too, making me and himself laugh at the latest thing he’s managed to find/do/get stuck in or under. 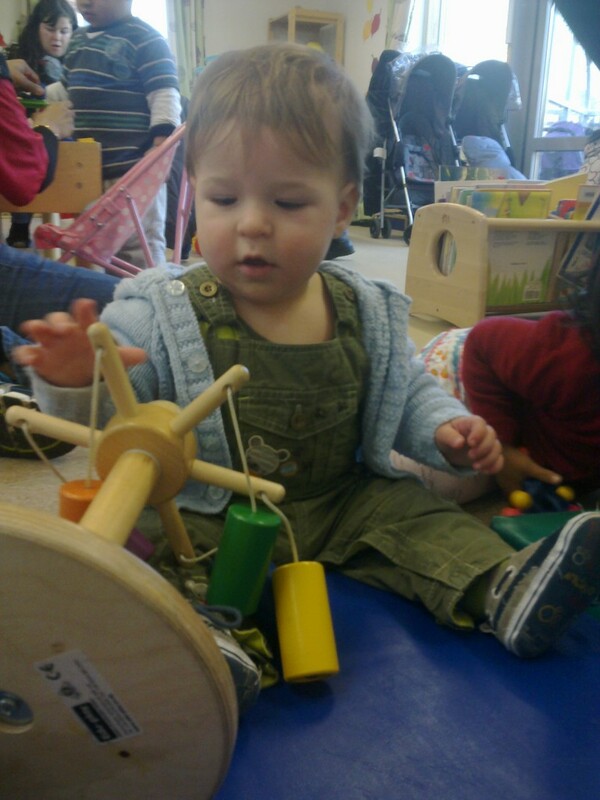 We go to fun groups where he can toddle around, play with different toys, sing, hear stories, make things and get messy, whilst I get a cup of tea made for me (which might go cold admittedly) and can chat with other mums (and dads) about the joys and woes of parenthood. I get lots of fresh air and exercise, which comes naturally in our routine because we walk everywhere. So that’s a lot of good stuff so far. The hard part is having to split my time between the two jobs. I worry that I’ll miss out on one of Andrew’s ‘firsts’, that I’ll be impatient with him because I’m too tired after a day or two in the office, that he’ll miss me either lots or not at all when I’m gone (the former being detrimental to him and the latter to me and my identity as his mum). I also worry that my heart might not stay in my research like it was, that I’ll be too tired to function properly, that I’ll not do my research to the highest standard I set myself. These worries on both sides basically come down to the fact that I’m a perfectionist, and by splitting my resources it might not be possible to do either job at 100%. So far I’m pleased to say that none of these worries have actually been an issue, but they are always in my mind. 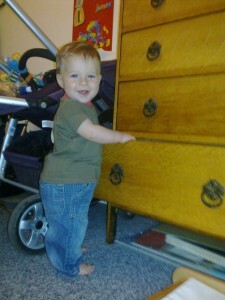 Look at me, I'm so good at standing. Mummy loves watching me grow up and do things like this for the first time. I was looking for a recipe for some muffins or little cakes that Andrew would enjoy. I’m not against him having some sugar, because I think if I completely deprive him of treats now, he’ll only rebel and go for it when he’s older anyway. And that’s what cakes are – treats – to be enjoyed as part of a balanced diet and healthy lifestyle (I sound like something off the back of a crisp packet or chocolate bar!) Tom and I like our cakes and puddings, but we also eat a varied diet with plenty of fruit and veg, and we can’t go for a day without some exercise. So that’s what Andrew is becoming accustomed to as well. That’s enough of an intro – I could probably write a whole post it seems on this topic. On with the recipe…. It’s based on one I found on the Sainsbury’s Little Ones website. This is a great collection of recipes suitable for babies, toddlers and adults. More of these recipes will no doubt feature in future posts, as I’ve tried several of them already and would love to share more. I adapted it slightly (basically less sugar and half oil / half milk instead of all the oil) to suit Andrew better. So, here we go. Preheat the oven to 180ºC, fan 160ºC, gas 4. Prepare a muffin tin with paper cases (I used a big muffin tin for Mummy/Daddy-sized treats and a fairy cake tin for Andrew-sized treats). In a separate bowl, beat the eggs, sugar, oil and milk together until pale and fluffy. Fold this mixture, and bananas, into the flour and oat mixture. Spoon the combined mixture into the muffin tin. Sprinkle the extra oats over and bake for 15 minutes until the muffins have risen and are golden. (I found that the bigger muffins needed more like 20 minutes, whereas the small ones were fine with 15 minutes). When cooked through, transfer to a rack to cool completely. Store in an airtight container for three days (if they stay uneaten for that long!) or freeze. Andrew approved – he ate one for a snack on not long after I baked them on Sunday. Tom was also impressed, so I’ll definitely be baking some more of these, and it’s handy that they go in the freezer to have a stock for when I don’t have time to bake them fresh. I’m not quite sure how to start a blog really, but I’m thinking it would be good to say a bit about why I decided to start one, and a bit about what this mixed bag of all sorts will include. In the world of blogging, I’m completely new – I’m vaguely aware that this makes me a ‘newbie’ or something like that. Am I also right in thinking that blogs tend to be on a particular theme? Well I’m not sure what I would pick as one theme, because I’m interested in writing about various things (more details to follow…). I guess over time a theme might emerge as the most dominant in the mixed bag, but for starters I’ll have a bit of all sorts and see how it goes (sounds like my kind of meal)! In the short bio on the ‘About this blog’ page, I’ve listed five things in my life that I’d to write about for now: mum-hood (I try to avoid the word ‘mother’ as it makes me feel old for some reason), my faith, craft and baking, languages and linguistics, swimming to keep fit. These may evolve over time, who knows. A few ideas for posts are already springing to mind as I type, and I hope I can get them written over the coming weeks. A note (more to self than to readers) on regularity is probably in order here: I’m not sure until I start how often it’ll be possible/practical to blog (oooh I love using nouns as verbs like this, also ‘to google’, ‘to skype’, but I digress, that can wait for a linguistic post…), so I won’t commit to a particular time scale for posts. No point in time pressure that would take the enjoyment out of it. 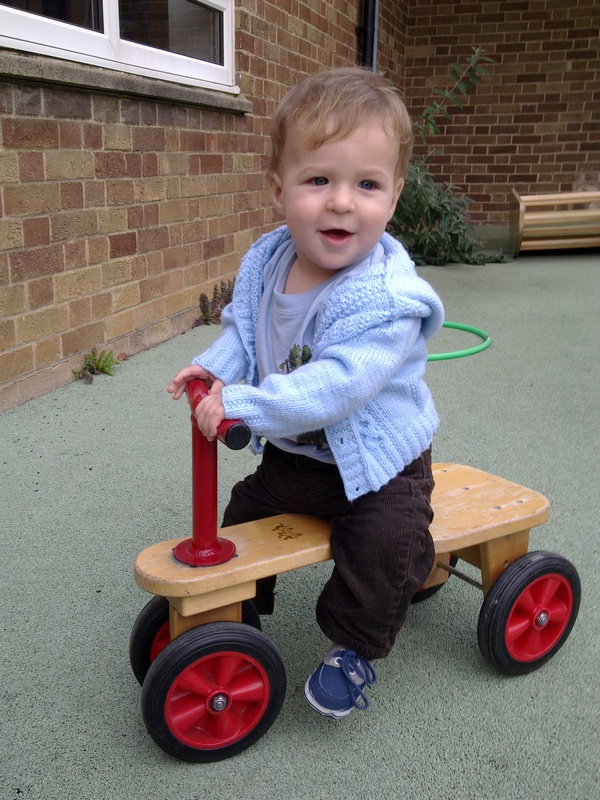 So ta-dah, voilà and there we have it, the first post on my squeaky, shiny, brand new blog. Bye for now and hope you come back for more soon!